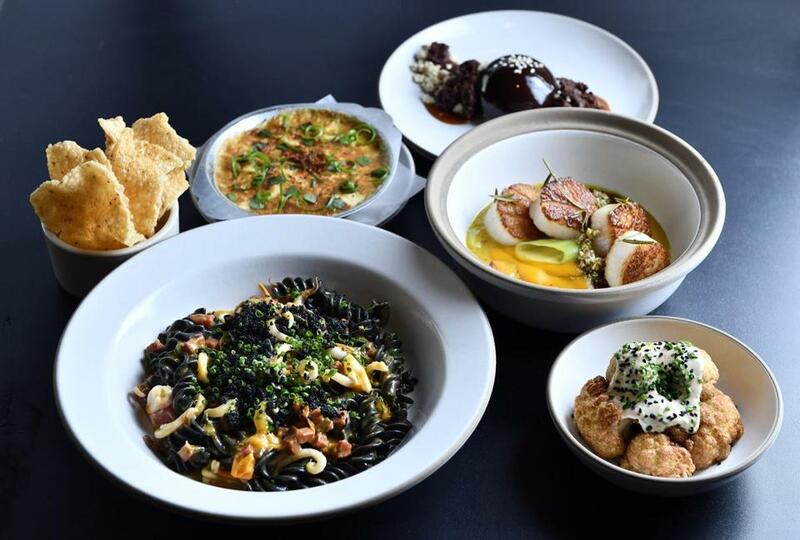 Clockwise from bottom left: squid ink fusilli, puffed rice crackers, crab gratin, chocolate semifreddo, scallops, and fried cauliflower at Chickadee. During lunch, the restaurant Chickadee offers sandwiches with ingredients tucked into pockets of pita: fried hake with the Yemeni hot sauce zhoug; cauliflower with fermented cabbage and harissa mayo. This same house-made bread is also served with dips like kohlrabi tzatziki and pimento feta. The pockets are pillowy, generous. You want to tuck yourself into one and take a long, cocooned midday nap, swaddled in a carbohydrate calm. This comfort, this ease alongside excellence, is the soul of the restaurant. If you want to find it, you’ll need to seek it out. 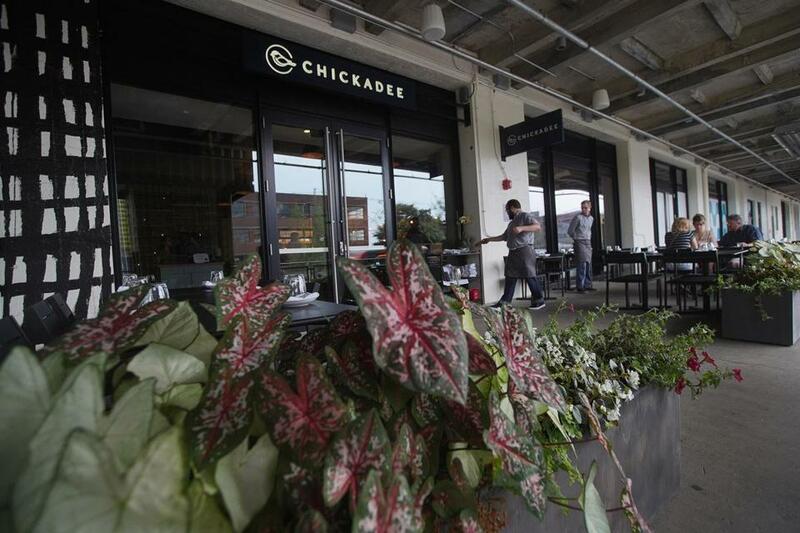 Chickadee opened this summer in the Innovation and Design Building, in the still-industrial far reaches of the Seaport, a stretch of streets through which trucks and tour buses constantly rattle. It’s home to ship-repair facilities and cutting-edge design firms, seafood wholesalers and biotech companies, showrooms full of covetable high-end fabrics and tile. If your work doesn’t bring you here, you’ve probably only visited Dry Dock Avenue to enroll in TSA PreCheck, and the good news is that this tango with bureaucracy can now end in a well-made cocktail. America’s Test Kitchen relocated here a year ago. A Flour bakery just opened. As a neighborhood rises up, amid all the nascence and burgeoning, we’ve got the most-polished opening Boston has seen in some time. 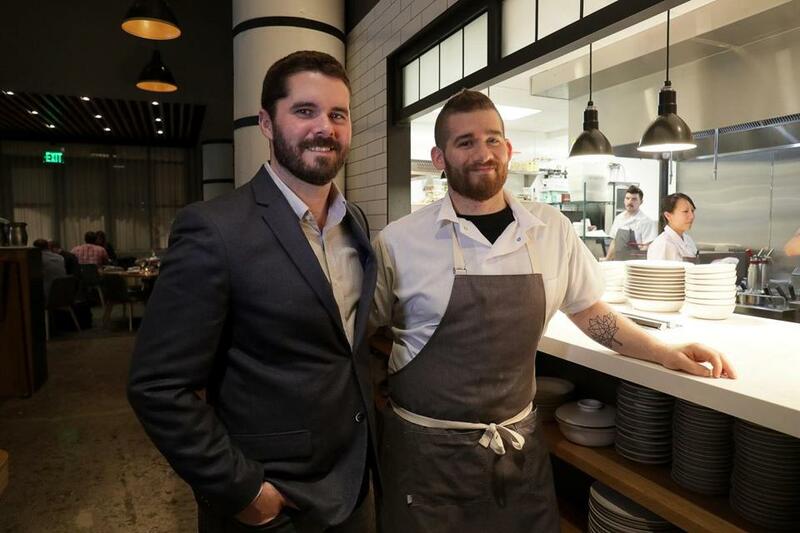 Chickadee owners chef John daSilva and beverage director Ted Kilpatrick met working at No. 9 Park, chef Barbara Lynch’s flagship. 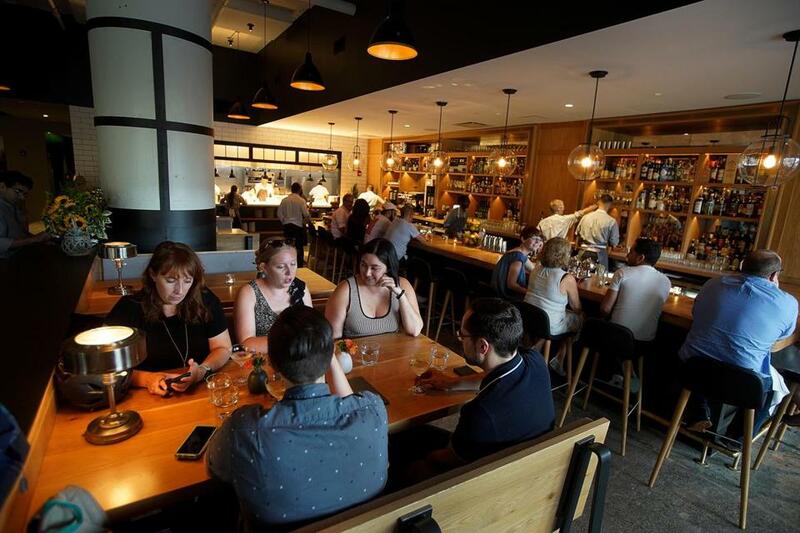 In some ways, Chickadee feels less like a new restaurant than a picking-up of where they left off, before daSilva made Somerville’s Spoke Wine Bar a destination and Kilpatrick went on to open restaurants with the O Ya team in New York. Ted Kilpatrick and chef John DaSilva. The restaurant itself is sleek, one space flowing into the next. The ceilings are lofty; the color palette is black, white, and gray; the dining room is spare and surrounded by mesh curtains. 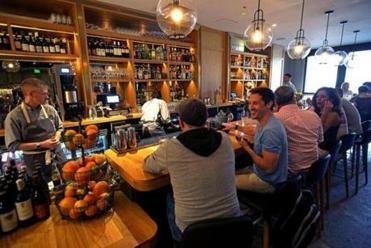 The bar feels warmer, an L-shaped wood stretch with a view of the open kitchen in back. “I just can’t forget that I’m eating inside the design building,” a friend said after a meal here, and it felt like praise and condemnation both. Chickadee’s interior, as pictured in early August. The Mediterranean-influenced restaurant from No. 9 Park alums is located in the Innovation and Design Building. But these modern appearances, they’re like a spell cast by some on-trend illusionist who has made us his captive Instagram followers. If you squint, the illusion wavers, and you can see what’s really behind it: a devotion to classic restaurant hospitality, a mastery of cooking technique, the ghost of white tablecloths past. Keep squinting, because this gives way, too. The food is fancy — or, really, fancyish — but it is generous, flavorful, and giving. The dishes draw from the Middle East, North Africa, Greece. You’d never call Chickadee a modern trattoria, a bistro, a pop-and-pop, but at its heart, well, you wouldn’t be wrong. Chickadee is located in the Innovation and Design Building. Vegetable dishes offer a moment’s pause to the richness. Beets with goat cheese, pistachios, and snipped herbs get a lift from Moroccan spicing. Grilled carrots have taken over restaurant menus all over the land, in celebration of the fact that someone finally figured out how to make the roots believable in a starring role. Here they are served over avocado hummus, crowned in a halo of bright carrot ribbons, with citrus vinaigrette and hazelnuts for crunch. A small head of cauliflower (now available at lunch only) is fried golden, served whole, draped in labneh-based ranch dressing and sprinkled with black nigella seeds. In some way it feels as if everything else at Chickadee exists so daSilva, chef de cuisine Stef Bui (who also worked at No. 9 Park), and their team can make pasta. (It was a highlight at Spoke, too.) There are snail-shaped lumache with lamb ragu and fava beans, dolloped with labneh and flavored with vadouvan, a curry powder. Fusilli are made with squid ink, the black corkscrews interspersed with bites of the Italian sausage soppressata and tomato, sprinkled with black ink-and-olive breadcrumbs — as bold in flavor as appearance. Little semolina gnocchi, crisped on the sides, are irresistibly of the season with hen-of-the-woods mushrooms and smoked chestnut. 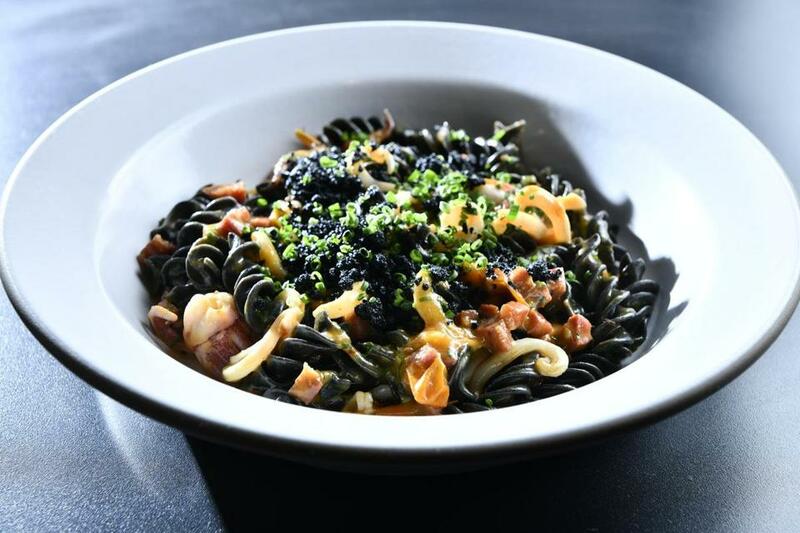 The squid ink fusilli at Chickadee in the Seaport. But also this is the rare restaurant where the main courses are often as interesting as all the little things you’ve eaten along the way. I can’t remember having better scallops, seared and piled into a drift of honeynut squash with leeks and cider. The porchetta, impeccably unctuous, is served with a salad of watermelon, chiles, mint, and peanuts, the heat and brightness offsetting the roast pork. Flavored with the Italian fish sauce colatura, it tastes as much like Southeast Asia as anywhere. It’s wonderful. For dessert, simple roast figs, jammy and sweet, are plated into elegance with little bits of cake and piped ricotta. 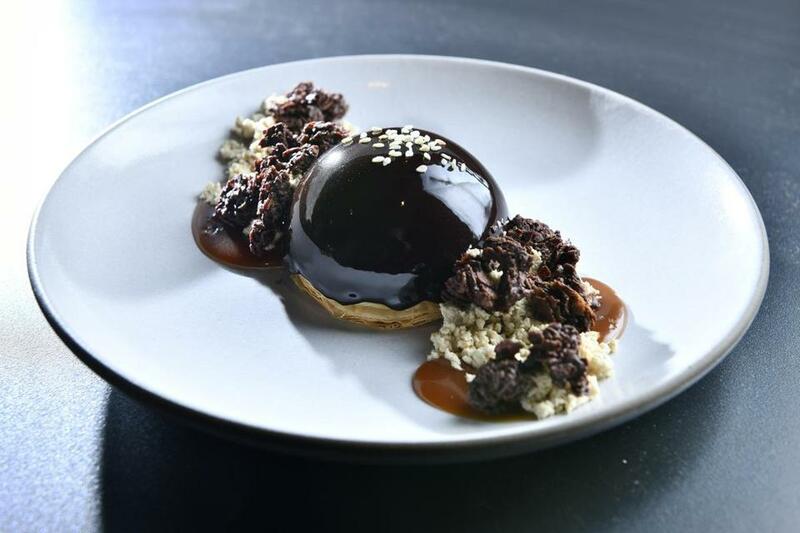 There’s an irresistible chocolate semifreddo, a glossy dome beside crumbles of halvah and a pool of caramel. Some meals here are magic, everything cooked perfectly, making you swoon. The servers are charming, knowledgeable about food, excited to pour a Txakolina rose someone hasn’t had before, perfectly present when you want them to be (and perfectly absent when you don’t). Other meals are a more ordinary version of excellent. Maybe the porchetta is a touch overcooked, or the roast chicken on the dry side (but served with corn, chanterelles, and burnt honey, so you almost don’t care); maybe the server is a little overeager, or it’s late and the energy level has dipped. But it’s been clear since Chickadee’s first week that daSilva and Kilpatrick know how to run a restaurant, one that serves wonderful food. This end of the Seaport is well on its way. Chickadee arrived early. Some meals here are magic, everything cooked perfectly, making you swoon. Servers are charming, knowledgeable about food, perfectly present when you want them to be (and perfectly absent when you don’t). 21 Dry Dock Ave., Seaport, Boston, 617-531-5591, www.chickadeerestaurant.com. All major credit cards accepted. Wheelchair accessible. Prices Snacks and vegetables $8-$12. Pasta $15-$16 (small), $26-$28 (full). Main courses $30-$36. Desserts $8-$11. Hours Mon-Sat lunch 11 a.m.-2 p.m., dinner 5-10 p.m. Noise level Conversation easy over frequently recurring Howard Jones tunes. What to order Chickpea panisse fries, crab gratin, fried cauliflower, fusilli, gnocchi, scallops, porchetta, chocolate semifreddo.